We have observed an attack led by the APT group Wekby targeting a US-based organization in recent weeks. Wekby is a group that has been active for a number of years, targeting various industries such as healthcare, telecommunications, aerospace, defense, and high tech. The group is known to leverage recently released exploits very shortly after those exploits are available, such as in the case of HackingTeam’s Flash zero-day exploit. The malware used by the Wekby group has ties to the HTTPBrowser malware family, and uses DNS requests as a command and control mechanism. Additionally, it uses various obfuscation techniques to thwart researchers during analysis. 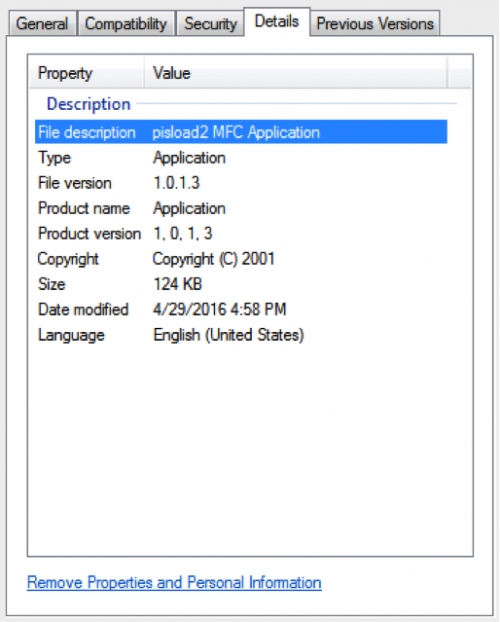 Based on metadata seen in the discussed samples, Palo Alto Networks has named this malware family ‘pisloader’. The pisloader malware family was delivered via HTTP from the following URL. At the time of writing, this URL was still active. Additionally, the following IP resolutions have been observed. This particular file has the following metadata properties. The references to ‘pisload2’ led to the naming of this malware family. The initial dropper contains very simple code that is responsible for setting persistence via the Run registry key, and dropping and executing an embedded Windows executable. Limited obfuscation was encountered, where the authors split up strings into smaller sub-strings and used ‘strcpy’ and ‘strcat’ calls to re-build them prior to use. They also used this same technique to generate garbage strings that are never used. This is likely to deter detection and analysis of the sample. The following decompiled code demonstrates this. Comments have been added to show the fully-generated strings. In the above decompiled code, we see that the pisloader is generating the following string, which eventually is called to set the Run registry key. This particular command will set the HKCU\Software\Microsoft\Windows\CurrentVersion\Run\lsm registry key with a value of “%appdata%\lsm.exe”. After this key is set, the malware proceeds to decrypt a two blobs of data with a single-byte XOR key of 0x54. The resulting data is written to the %appdata%\lsm.exe file path. After this file is written, the malware executes the newly written lsm.exe file, which contains the pisloader payload. The payload is heavily obfuscated using a return-oriented programming (ROP) technique, as well as a number of garbage assembly instructions. In the example below, code highlighted in red essentially serves no purpose other than to deter reverse-engineering of the sample. This code can be treated as garbage and ignored. The entirety of the function is highlighted in green, where two function offsets are pushed to the stack, followed by a return instruction. This return instruction will point code execution first at the null function, which in turn will point code execution to the ‘next_function’. This technique is used throughout the runtime of the payload, making static analysis difficult. The malware is actually quite simplistic once the obfuscation and garbage code is ignored. It will begin by generating a random 10-byte alpha-numeric header. The remaining data is base32-encoded, with padding removed. This data will be used to populate a subdomain that will be used in a subsequent DNS request for a TXT record. The use of DNS as a C2 allows pisloader to bypass certain security products that may not be inspecting this traffic correctly. The malware expects various aspects of the DNS responses to be set in a specific way, or else pisloader will ignore the DNS reply. The following DNS flags must be set. Should any additional flags be set, the response will be ignored. The ‘Questions’ field must be set to a value of 0x1. The ‘Answer Resource Records’ field must be set to a value of 0x1. Additionally, the response query subdomain must match the original DNS request. The remote command and control (C2) server is statically embedded within the malware. 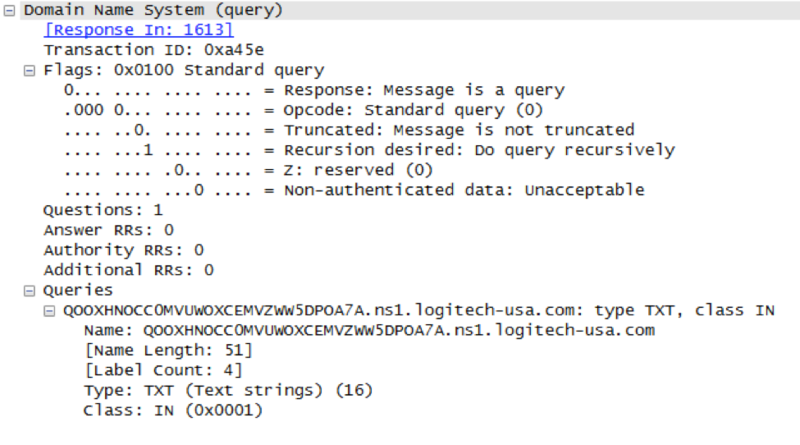 A single host of ‘ns1.logitech-usa[. ]com’ is found in this specific sample. The C2 server will respond with a TXT record that is encoded similar to the initial request. In the response, the first byte is ignored, and the remaining data is base32-encoded. An example of this can be found below. Some examples of these commands being used can be seen below. 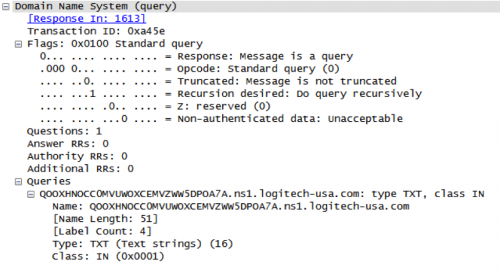 A mock DNS server was used to generate the commands and receive the resulting data. The sifo command above uses the printf format string of ‘l=%s&c=%s&o=%s’. This is consistent with previous versions of HTTPBrowser, which is another malware family frequently used by the Wekby group. Additionally, a number of commands themselves, such as the ‘list’, ‘drive’, and ‘upload’ commands are consistent with HTTPBrowser. The formatted responses from these commands are also identical. A known HTTPBrowser sample was spotted with similar metadata as the discussed pisloader sample, which adds further credibility that pisloader is likely a variant of this malware family. Additionally, the code used to generate these commands is available via GitHub. The Wekby group continues to target various high profile organizations using sophisticated malware. The pisloader malware family uses various novel techniques, such as using DNS as a C2 protocol, as well as making use of return-oriented programming and other anti-analysis tactics.